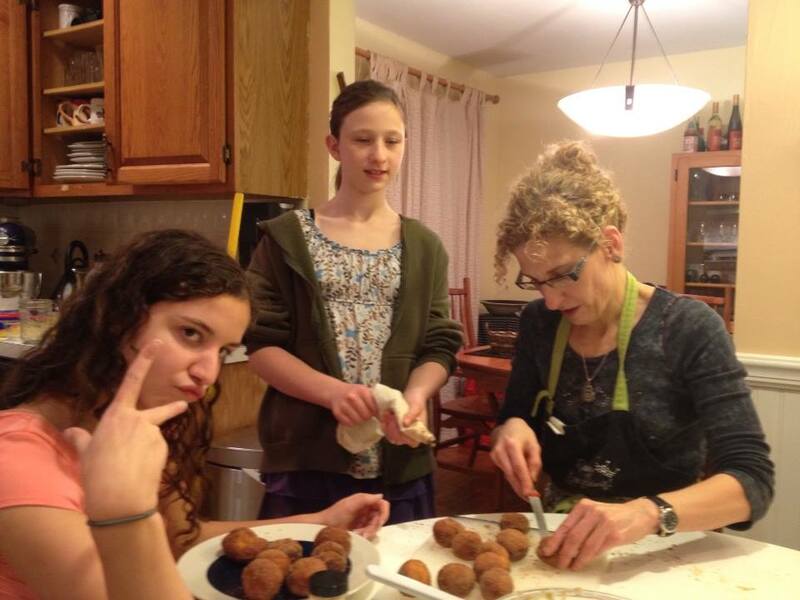 Merging minhagim: Filling sufganiyot with pumpkin pastry cream with my favorite sous chefs. I had already had enough of Thanksgivukkah and its menurkeys (that’s a menorah shaped like a turkey for you blissfully uninitiated) when I saw the bourbon pecan pie adorned with Chanukah gelt. This was supposed to be yet another recipe merging the Chanukah and Thanksgiving traditions, but really it was just a pecan pie with some gelt strewn about the border. Apparently it needed to be added to the growing cannon of Thanksgiving/Chanukah dishes. Because, if you haven’t heard by now, or if you’ve been under some sort of social media rock, Thanksgiving and the first day of Chanukah overlap this year, something that has not happened since 1861 and won’t ever happen again. Ever. (Erev Chanukah, however, will begin on the Thursday evening of Thanksgiving in 2070). Which has all led to some decided holiday silliness, if you ask me. But then Thanksgiving is, at least since I’ve been an adult living away from my family, a bit of a challenge for me. When we first married, my English husband found the holiday peculiar and no amount of explaining the Pilgrims, Indians and corn seemed to get the idea across. “Why do they make you eat Christmas dinner one month in advance,” was his comeback. This from the son of a kosher butcher; but apparently in England even the kosher butcher brings home a roast for Christmas Day and listens to the queen on the telly. So instead of celebrating the annual day that turkeys rue, I’d offer myself up to my editors at the newspaper where I was employed as the Reporter Willing to Work on the Holiday. I’m not complaining; it was a good gig. I got paid double time and got comped an extra day or two as well. In exchange I’d get to cover some warm family ritual like a drunken stabbing over carving the bird. It made you think twice about arguing about cornbread versus chestnut stuffing. Once Avrom and I had kids, though, I figured we would buckle down and Do the Right Thing. So when my son, Nathan, was in kindergarten, and his class at the local Jewish day school studied Thanksgiving by pretending to be oppressed Indians in buckskin vests constructed of paper bags, I made a full-throttle turkey dinner, cornbread stuffing, pecan pie, brussel sprouts, the works. At mealtime, Nathan climbed up in his booster seat, took one look at the spread and said, “I’m not hungry.” Really? Not even the sweet potatoes with marshmallows? After that, Thanksgiving faded into the background. Oh sure, once we went to a friend’s house. And for many years we trekked to my aunt’s house in Lexington, Mass. I made pareve pumpkin pie with coconut milk and we spent the days after the holiday working en famille on one of those giant jigsaw puzzles of a box of chocolates. On years when we didn’t make the trip, we ate in Chinatown or once, at a Bukharan restaurant in Queens. But that’s all changed this year. My aunt has moved, her place is small and I decided, since her daughter lives in Brooklyn and I’m in New City, they should come to us. And so for the first time in an extraordinarily long time, I am hosting Thanksgiving, which is why, as my Facebook newsfeed reminds me, almost by the minute, I am pondering the alignment of the lunar and solar calendars that has brought the American celebration of religious freedom and survival against the odds (you forgot those parts, amid all the arguments about stuffing, right?) neck and neck with the Jewish holiday of survival against the odds and religious freedom. That’s right, if you’re looking for a Chanukah-Thanksgiving connection, look no further than the Pilgrims, who left England assailed by religious persecution, to find happiness (well, near starvation, really) in hardscrabble Massachusetts. That they then took to persecuting others for their religious beliefs, well, I will leave that to the irony police. Chanukah, of course, tells the tale of the Maccabee uprising against Assyrian persecution and Jewish assimilation of Hellenistic practice and ideals. That the Maccabees held out is the miracle; that they were killing their own people — well, maybe they have more in common with the Pilgrims than we realized. But Thanksgiving has no conflicting beliefs or cultural taboos attached to it and hence, a lot less anxiety. Everyone can celebrate Thanksgiving. And for the most part (my odd family and some fervently Orthodox excluded) most Jews do. It is a holiday that is grounded in American ideals and stripped of religious specificity. The myth-making involved in the Pilgrims uniting with the Indians who helped them weather their first winter tips its hat to multiculturalism while offering gratitude for living in the land of opportunity and abundance. What’s not to like? Never mind that it looks a whole lot like our own harvest festival, Sukkot. With its sense of plenty coupled to the end of the growing season, the Pilgrims pilfered the holiday from us. So Thanksgivukkah feels like a suitable bit of cultural appropriation. Jews are the masters at this. Wherever we go, we’ve adapted holidays to fit in the broader culture. Chanukah is a bigger deal to many Jews in the Western hemisphere than most of the Torah-based holidays simply because it usually arrives wrapped in a bow at Christmas time. In India, I am told that Purim outstrips other holidays because its sanctioned mayhem frequently coincides with Holi, a raucous precursor to spring where people squirt one another with powdered paints. Now that Chanukah and Thanksgiving coincide, the time seems ripe for the greatest holiday mash up since Bridget loved Bernie. I was trying my best to avoid succumbing to menus rife with Manischewitz-brined turkey (I mean, why not just do the deep-fried turkey thing instead? Our holiday is about the oil, after all. ), matzah ball turkey stuffing, pomegranate-cranberry sauce, and sweet potato latkes. But as they say, if you can’t beat ‘em, join ‘em. Enjoy the pumpkin cream-filled sufganiyot. I’ve included separate recipes for the doughnuts and the pastry cream. I’m not sure whose tradition this emulates, but it’s probably one that could have only been concocted in America. And maybe that’s what Thanksgivukkah is all about.